Admins can invite teammates at any time. 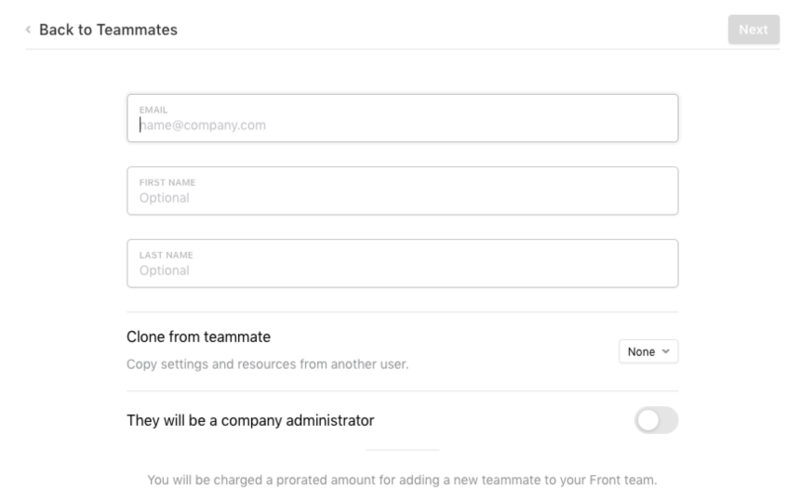 Company admins are able to access and invite teammates to any Team (if on the Enterprise plan), and Team admins can invite teammates to their specific team. Admins can also manage teammates' settings after the teammates have been invited, as well as clone an existing teammate's settings for a quicker setup. Go into your Settings, select Teammates (either under the Company section or the Team section), and Invite a teammate. Enter your teammate's email address, first name, and last name. If you wish to make this teammate a company administrator, turn the toggle on. You have the option to clone this teammate's access and preferences from an existing teammate. Give your teammate access to whichever team inboxes you wish, and click Invite teammate. Your teammate will then receive an email to complete their set up. They will click the link in the email and walk through the setup screens. Note: Be sure that your teammate does not sign up for their own trial on our website, as that will create a brand new company for them. If they accidentally did that, you will not be able to add the same user to your company, so please email us at support@frontapp.com to tell us their email address and we will remove their incorrect account.